Islam and Europe... These are the two concepts which have been increasingly subject to big debates, particularly since the last ten years. Living as a Muslim in Europe, thus, rises a lot of issues related to the controversies about these two concepts. Is it an advantage or disadvantage for Europe to comprise Muslims or do Muslims really face menaces in Europe or is the debate of "Islamophobia" is nothing but exaggeration? Ahmad Vincenzo, who had been the guest of Lastprophet.info, answered these questions for Lastprophet.info readers. Born in Naples in 1961, Vincenzo converted to Islam in the presence of Sheikh Abdul Wahid Pallavicini in 1990 after a journey of long and in-depth religious research. 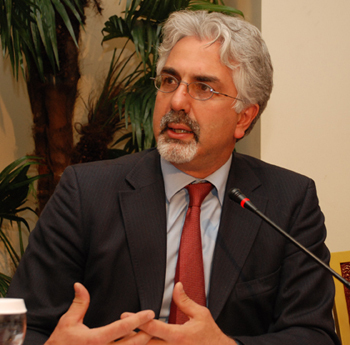 Vincenzo, who is considered to be a leading representative of Italian Muslims, lives in Milan and is one of the founders of theIntellettuali Musulmani Italiani (Italian Muslim Intellectuals). Vincenzo continues to give lessons at Frederico 2nd University in Naples. Vincenzo's book "Il Libro Disceso Dal Cielo", which was translated into Turkish as "Yesrib'de Bahar" (Spring in Yathrib) describes the life of Prophet Muhammad in literary language; the book has also been translated into German under the title "Das buch das vom Himmel kam." Vincenzo has also published another work entitled "Islam, l'atra civilita" (Islam, the other civilization). Can you tell us about your conversion story? My conversion changed my perspective completely. I don't think I can talk about the conversion, except in the sense that I discovered perhaps that I had always been a Muslim from the beginning; it was natural. Becoming Muslim is to believe that there is no God but Allah; but the fact that Muhammad is our Rasulallah, I couldn't believe this. I didn't recognize this. You have to be ready to testify that it is real, only then you are Muslim. When the exact moment of conversion was - I don't know. It is a strange fact that the first Muslim country I visited after my conversion was Turkey. I think like that because being Muslim in Turkey has a spiritual perspective; it is a tradition of the religion, the spirituality of the dialogue between Muslims and Christians, the culture. I found all of this here. Did you come to Turkey to learn more about Islam? Under these circumstances, I perfected my prayers in Turkey. After becoming a Muslim you have to manage different kinds of living; different prayers in the day, I perfected them here. I learned to pray well and Turkish people helped me in very spiritual way; very gentle, very kind, correcting my pronunciation. I think that this is not a coincidence. Anything that is Islam now is Islam between East and West, between the Bosphorus and the Aegean Sea; it is the Islam of the balance between religion and spirituality, between dialogue and identity, between a young generation that wants to know and the older generation, which is perhaps forgetting the religious rules. Islamically, this country is very interesting; it is interesting from the aspect of Islamic history; but it is also much more dangerous, because we can lose a lot. We need to find the basis of Islam, what is essential, what is absolutely necessary, because we are losing our heads. We have to make sure that we don't lose what is necessary to Islam, like the prayers, like the presence of the Shahadah in our hearts and our lives. These are very important. When you became Muslim what were the differences and difficulties you met in your own society? It is really difficult for people to understand that you became Muslim. I did it openly, I never tried to hide my Islamic identity, I continued to teach at the university, but this was difficult. Can you mention about the Islamic community in Italy? It is very young, very articulated, very multi-ethnic, there are people from all over the world, from all Islamic countries. It is very young in all senses. We have no organization, no culturalization, no NGOs, no Islamic press, no Islamic cultural organizations. But there are a lot of young people who would love a really good place to live. Italy is a really good place to live, but there are many problems and they want to solve these problems. This is not impossible, to solve the problems of the Islamic community in Europe. We need a class of managers in the Islamic community that can deal with this world without hiding their Islamic identity. This is not impossible. With respect to the future of the Islamic community Italy and the reaction of the non-Muslims to the Islamic community, what is the biggest problem in the relationship between these two entities? The problems are the fact that we are weak; we are in a very competitive society. If you are weak the strong try to force you to submit to take advantage of you. Dialogue can only exist if you are strong. Strong in identity, strong in culture, strong in the idea that the Islamic community has to play a role; if you are strong in these you can enter dialogue. But if you are weak and closed into a national perspective, trying only to present an image of your national origin, then there will be a conflict, because there are many forces in Europe which will be happy to choose a weaker community in order to play the role of conflict in society. How can these problems be overcome among the Muslims? How can unity be insured? For me it is the fact that Islamic countries have in the past helped only a few communities of their own nationalities. Tunisia helps Tunisians, Turkey helps Turks, Pakistan helps Pakistan without any cooperation or collaboration. We also have a strong international organization; the organization of Islamic Conference is second only to the United Nations. Now the general secretary is a Turk. In this field, in this organization the idea of better cooperation between Islamic countries will really help the Islamic community. To put together a community we have to put together a community, we have to face problems with the Arabs; much more books, more journalists. But I think that if the young Islamic community in Europe is growing. The Islamic countries that the time has come for better cooperation, but not only cooperation, but also playing a major role in Europe. I do believe that Turkey can help the European community with this. No strong actions support the Islamic community in Europe. Because the first political lobby is a lobby of Muslims and we need this kind of lobbies. In Europe, we're lobbyist. With the creation of Europe, Europe became lobbyist. The mass media - we also need a culture that influences political leaders and parties, we don't have this. Do you agree with the idea that one country should be leading all the Islamic countries; there should be one or two leading powers with all the others united behind them? I am publishing a new essay on the idea of pluralism in the Islamic tradition. What we need is societies that change; from a national, ethnical, racial idea to a multi-cultural idea, a cosmopolitan idea; much closer to the Ottoman idea of a state - not a state closed to itself, but a state that is open. What we need is not Islamic power or Christian power or Jewish power, because I believe that there are good people among the Jewish people, the Christians, the Muslims, also secular people. What we need is a strong pluralism or the respect of the others, an idea that the nation can carry on also with the minorities; without closing off these minorities, without putting away the minorities. We need states that are multi-cultural, with many majorities; we need a society that is pluralist, which recognizes the other community, with the idea that every community has a right to be in a country. This is the major political influence of Islam, pluralism all over the world. Do you think that the situation is being exaggerated or Is there a real danger for the Muslims living in Europe? There is a real danger because the idea of putting the religious minorities into ghettos is not so old. This is ancient. It has been practiced on the Jewish people for centuries. For the last 500 years we have kept the Jewish people in different sections to hide them from the majority of other Christians. After 1492 the kings took the Jews and Muslims away from Spain. 50 years ago there was a pontifical order to send Jews away from the majority community into ghettos. There is a danger for European democracy. Now there are the first Arab ghettos in Europe and ghettos are couraged by the local administrations because they want to keep all these people in ghettos and also to keep problems. If you have a ghetto you always have problems. And if you have problems you can campaign against Islam. So, it's a popular policy, it's very useful. Yes. You're living in a very great Islamic nation. In Italy, in Europe there is no chance of an Islamic publisher, an Islamic channel; there is no chance to even go inside a television channel. There is no room given for religious publishing or for cultural life. We're a lot in number in Europe, but in comparison in how we are in the cultural life, while there two millions of Muslims and 45,000 Jews in Italy, but there they have a presence in the media, presence in the publishing, presence everywhere. What about your books? How were they received in Italy? They tried to narrow the influence of the book. I know that the same publisher, after our understanding that the book would be translated in Spain, Holland, Germany, Turkey, it is interesting that they distributed the book among young people under nine years of age. They only featured it in primary school, it was not advertised in high school or secondary school. Did you ever think to work on other projects? I have a project about politics in Islam. I want to write nnovels. I finished a novel about the meeting between St. Francis and Malik al-Kamil, the Sultan of Egypt. You know that St. Francis was the saint of Italy and met the Islamic leader of his age. I wrote from St. Francis' point of view. And I would like to write a novel about interreligious marriages. Because there are many problems in the society. And what do you think about the organizations of Lastprophet.info? It is fantastic. In Europe it is very difficult to speak about Islam. To meet with people, to speak with journalists; this is the best way to work; but also for us, it is also very important as it is really a way in which you can meet people and understand much better our work. When you are writing a book or a novel, you are not really aware of what the impact can be. So, the transport of dialogue between us is very important. I have now a lot idea in order to write in my future works because I met people, I spoke with them and they told me many things and understood what is necessary as well. Turkey, for example, how to play a cultural role with Islam... It's absolutely necessary. The Arab world is not open. Do you know how many Western books are translated in all the Arab nations every year? Two hundred. Only two hundred. iWhat is also important is that I don't know if all the best Arab literature is translated in Italian because in Italy. In Europe we know well the secular Arabism instead of the fact that we need to have much more knowledge about people in Turkey or Morocco, for example. What about the primary features of Prophet Muhammad that influenced you? Prophet Muhammad was an example that our knowledge comes from Allah. Imagine yourself at the university and the student asks something to the teacher, and the teachers says "I don't know, but Allah may explain me, inspire me, insh'allah." This is Prophet Muhammad; inspiration from God. This is the reality of Muhammad, this is nur-i Muhammadiyyah. Also in specialistic fields like fiqh, you have some principles; ijtihad. It's divine inspiration. This is inspiration, divine inspiration from Allah for a better understanding how to manage the material in a new actual perspective. Why is he such a fierce target for people in Europe? They don't care about him. They only want to be against Islam and against the Islamic community. So he is just a tool for them? They don't believe in the prophecy. Prophecy for them is nothing. Please type '698' into this field.